Weddings are full of beautiful emotion, heartfelt moments, and at times hilarious hijinks that make for great memories. But the truth is, big weddings aren’t for everyone. And that’s fine, great even. You do you! Elopements are a great alternative. If you’re already planning to elope, you know your reasons. So if you’re looking for a Portland elopement photographer to explore a beautiful location in the Northwest or in some far flung locale, then let’s get this party started. Feel free to inquire at the bottom of the page. But for those who are still weighing their options, below are a list of reasons why eloping might be right for you. 1) Save Money For A Rad Vacation Or House. Big, traditional weddings make for an amazing time, but they can also be ridiculously expensive. They are certainly a substantial investment, and for a great many it is an investment worth making. But depending on your particular outlook, you may value the experience of traveling abroad with your partner over one day of tradition. Combining your elopement and honeymoon is really easy. At the end of the day, it’s a personal choice, and with family in the picture it can be a difficult choice. But if dropping a ton of dough on a wedding prohibits you from following your dreams of going on a rad adventure or if you highly value exploring other lands then maybe eloping is the right choice. The same goes for buying a house. In some cases, paying for a wedding can be darn close to a downpayment on that starter house you’ve been eyeing. If the idea of staying in that small apartment you’ve been sharing with your partner, and perhaps other roommates, isn’t appealing then an elopement, again, is a good option. 2) Eloping Can Be A More Intimate, Relaxed Experience. When it comes to weddings, scheduling is very important. You have a set ceremony time that went out on your invites, and you don’t want to run late and make your guests wait. There are a lot of moving pieces and a lot of expectations to go around. Add to that, emotions are on high. After all, mommy’s little girl is getting married! Yes, weddings can be an amazing experience, but they do come with an element of stress caused by everything built around them. Elopements on the other hand are super mellow. Timing is not as crucial because there are fewer vendors and events to account for. You can sleep in. Fewer people are asking you questions. Not all eyes are glued on you while you empty your heart out. You are thus more present, mindful, and in tune with your partner. 3) Elopements Are Less Stressful To Plan. This goes hand-in-hand with the point made above. Weddings take a lot of time and work to plan. You have to book all of your vendors and get them on the same page. You have to find that perfect venue that meets all your needs. There’s food and dessert tastings, transportation to arrange, lodging to reserve, decorations to design or order, bridesmaids dresses to pick out, etc. If you’re a planner at heart, then planning your wedding might be the funnest thing in the world. But if you’re not, eloping is a great alternative. Just find a beautiful location where you’ll feel comfortable saying your vows, set a date with the few vendors you’ll need, buy your plane ticket or jump in your car, and show up in your beautiful gown or suit. Okay, there’s more to it than that, but there’s a whole lot less to worry about than when planning a wedding. 4) You Don’t Have To Worry About Inviting Every Friend And Family Member. One of the more awkward elements when planning a wedding is having to omit certain people from the guest list. You have a budget and things would get out of hand if you invited absolutely everyone. Maybe you have a couple relatives you don’t get along with but who will still get offended if you don’t invite them. Or maybe you have a large friend group but there are some that you’re not all that close with. After invites go out, you then may get stuck having to justify why certain people weren’t invited. However, when you elope you don’t have to worry about the guest list and keeping headcount. The expectation is that it’s going to be very, very small. If it’s just the two of you and a photographer, maybe a couple friends or family members, then the drama potential is a whole lot less. 5) You Have More Flexibility Choosing Your Ceremony Location. 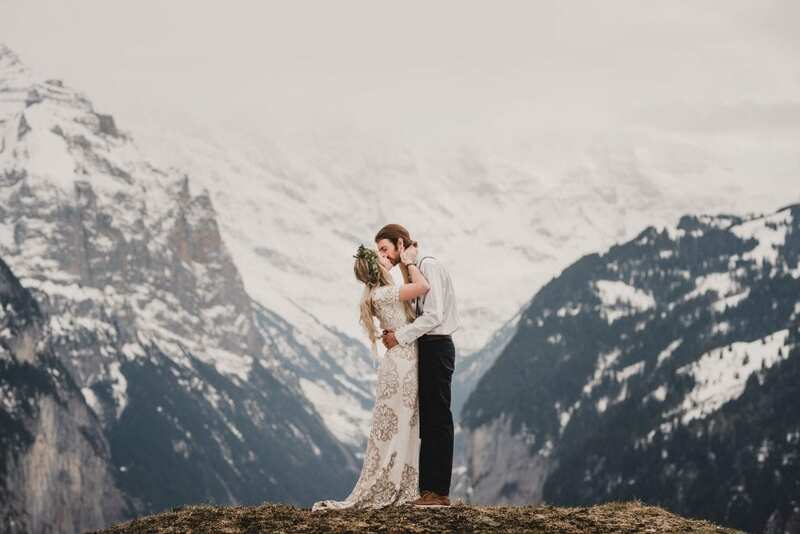 Have you ever dreamed of getting married on a remote beach, maybe even on a mountaintop, or somewhere else equally adventurous and awesome. Well, getting all of your friends and family there might be a challenge. So instead of following through with that dream, you settle for an easier to reach venue. And while it may still be beautiful it may not be as epic, solitary, or peaceful as you had imaged for this special moment. If you get eloped, the world is your oyster. Does saying your vows at the bottom of the Grand Canyon sound amazing? You can do that! How about hiking into a beautiful secluded beach on a Hawaiian island? No problemo! You’re only limited by your imagination. I don’t intend to get on a soapbox and get all preachy, but the leftover waste from weddings is indeed substantial. There are ways of minimizing their impact, which is a topic unto itself. But if you consider yourself a steward of the Earth and you want to just skip all that waste, eloping is much less burdensome on the environment. 7) You Can Wear Whatever You Want! Wedding dresses are classic and steeped in symbolism. They’re baked into our very minds at a very young age. Wearing a white gown the day you get married is just how the world works. And you want that experience of being the bride (or groom for that matter). I mean, right? But, if you’re already considering eloping, you’re probably not the type of person who’s absolutely tied to tradition. So, honestly, you can wear literally whatever you want when you get eloped. You can get creative with dress and suit styles and colors. Heck, you don’t even have to wear a dress. Say your vows in swimsuits on a cliff over the ocean and then immediately jump in the water. Get that honeymoon started pronto! Without the time constraints of a wedding, you, your partner, and your photographer have so much more freedom for portraits. You have time to explore, time to check out a variety of locations. You really don’t have anywhere to be within a strict timeframe, so the experience of having your portrait taken is so much more relaxed. When cuddling with your fiancé in front of the camera, you’ll be fully present without a care in the world. 9) You Can Still Have A Reception At A Later Date. If you choose to elope you can kind of have the best of both worlds. You’ll get that more intimate, adventurous experience with your partner without the distractions and stress of a larger event. But afterward, if family is really wanting to celebrate with you, there’s nothing stopping you from hosting a reception a number of months down the road. That reception also doesn’t need to be a traditional sit-down dinner event. It can be more of a party from the get-go. It’s really an ideal situation. 10) You’ll Have More Money To Spend On The Things That Matter Most. Two of the biggest wedding expenses are the venue and the food. When you eliminate those two things by eloping, your budget for things that may be more important to you suddenly become a lot larger. If photography is something you highly value (wink, wink) then booking that amazing photographer who may have originally been out of your budget suddenly becomes possible. 11) You’ll Have More Time To Spend With Your Fiancé. I end here because I honestly think this is the biggest reason to consider eloping, more so than even the monetary aspect. If you opt for a wedding, you’ll have do divide your attention between so many more people. By the time the wedding is over, you may realize that you didn’t get to spend all that much time with your partner. Maybe you ate dinner together, danced together, and had your photos taken together. But it was dinner with guests coming up and talking to you, dancing while everyone watched, and photos taken alongside all of your family members. Rarely on your wedding day is it just the two of you. When you elope, you can prioritize much, much more quality time together.